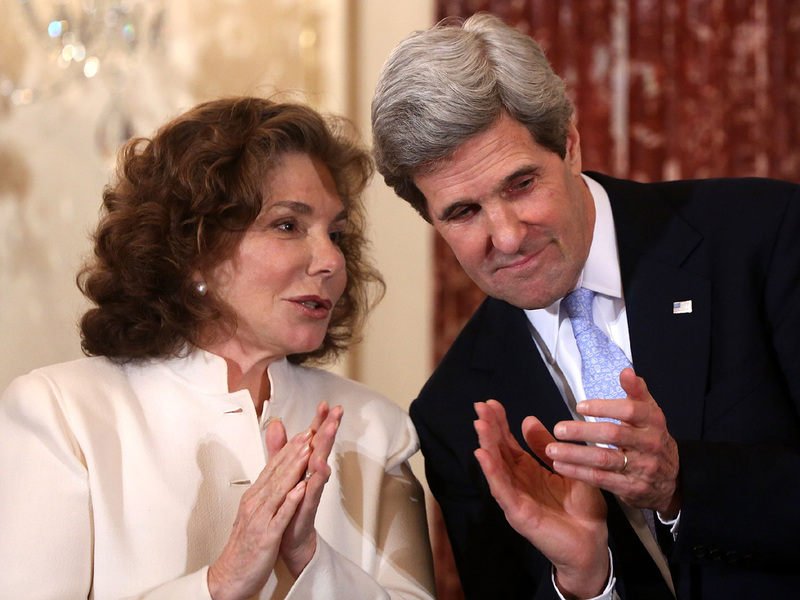 BOSTON A family spokesman said that the condition of Teresa Heinz Kerry, the wife of U.S. Secretary of State John Kerry, has been upgraded from critical to fair after being hospitalized for what some reports described as symptoms characteristic of a seizure. In a statement, Glen Johnson, personal spokesman for the secretary of state, said Heinz Kerry's condition was upgraded after tests conducted overnight and this morning at Massachusetts General Hospital in Boston. She is undergoing further evaluation, said Johnson, who added, "The family is touched by the outpouring of well-wishes." Teresa Heinz Kerry, heir to a ketchup company fortune, was admitted Sunday in critical condition after showing symptoms consistent with a seizure, a person in close contact with the family said. Heinz Kerry was flown to Massachusetts General Hospital on Sunday night after doctors at a hospital on Massachusetts' Nantucket Island stabilized her, said Johnson. A spokesman for Nantucket Cottage Hospital said Heinz Kerry arrived in critical condition, although doctors were able to stabilize her. Family members saw her exhibiting symptoms consistent with some sort of seizure, said the person in contact with the family, who spoke to The Associated Press on condition of anonymity because the person was not authorized to speak publicly about Heinz Kerry's condition. The New York Times also reported they were told Heinz Kerry showed symptoms of a seizure. The secretary of state was with his 74-year-old wife as an ambulance first transported her to the island hospital, and also during her transfer to the Boston facility. Before his wife's medical problem, Kerry had planned to return to Washington on Monday and then co-host with Treasury Secretary Jack Lew high-level strategic and economic talks with senior Chinese officials on Wednesday and Thursday. Kerry had also spoken of his desire to make his sixth trip to Israel as secretary starting at the end of the week. State Department officials said Kerry's schedule may now change pending developments with his wife's health. Kerry had been at the Nantucket home since returning from a nearly two-week, around-the-world diplomatic trip to the Mideast and Southeast Asia in the pre-dawn hours of July 3. Heinz Kerry, who born in Mozambique, is the widow of former U.S. Sen. John Heinz and heir to the Heinz ketchup fortune. Heinz died in April 1991 when a helicopter collided with a plane over a schoolyard in Pennsylvania. The senator was among seven people who died in the crash. Heinz Kerry and John Kerry married in 1995. She enthusiastically participated in her husband's campaign for president in 2004 and became known for her strong opinions, sometimes attracting as much attention as the candidate. Doctors treated Heinz Kerry for breast cancer in late 2009. She previously said she found out in September 2009 that she had cancer in her left breast after having her annual mammogram. A month later, she underwent lumpectomies on both breasts at a Washington hospital after doctors also discovered what they thought was a benign growth on her right breast. That diagnosis was initially confirmed in postoperative pathology, but two other doctors later found it to be malignant. In November 2009, Heinz Kerry underwent another pair of lumpectomies.